The contractor's gauge is designed for a wide variety of industrial applications, but is especially suited for heating and air conditioning systems. 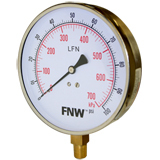 The rugged gauge case is made of stainless steel to provide the protection needed in corrosive atmospheres. Connection and wetted internal components meet Federal lead free requirements.